Ramayana: The Game of Life (Book 1), one of the world's great literary masterpieces, skillfully retold for modern audiences. Epics like the Ramayana have been recounted infinite times. Is there a need for another chronicle in the presence of so many? How is this one different? And is it relevant to our ever-changing modern lives? Yes, there is a need, yes this is different and yes, it is relevant. This new series of books, each following one khand of the Ramayana, decodes the eternal wisdom of that poetic scripture through gripping narrative and thought-provoking instruction. In the time-honored custom of spreading wisdom through tales, every fascinating story in the epic is retold here and every character unfolded to captivate your heart and open your mind to life's deepest questions. The narrative closely follows Valmiki's Ramayana, gently weaving in folk tales as well as the beautiful analogies of the Kamba Ramayana. 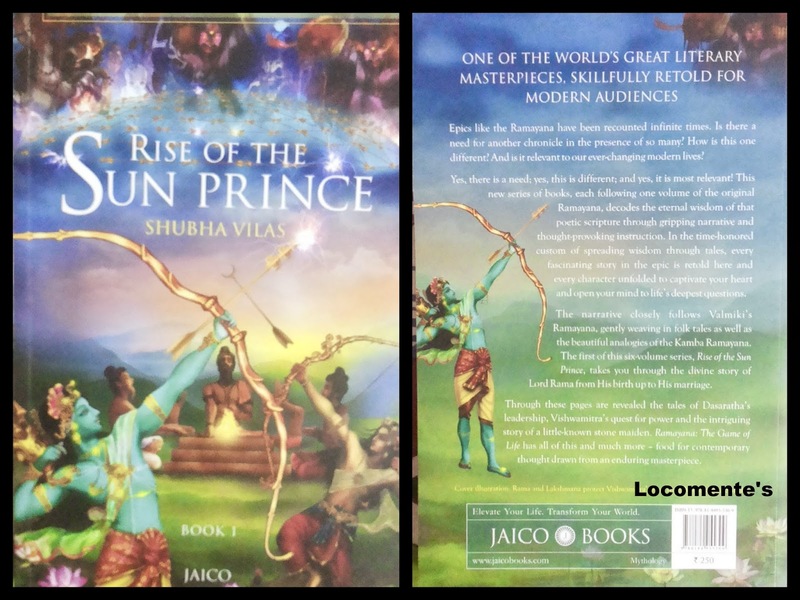 The first of this six-volume series, Rise of the Sun Prince, takes you through the divine story of Lord Rama from His birth up to His marriage. Through these pages are revealed the tales of Dasaratha's leadership, Vishwamitra's quest for power and the intriguing story of a little-known stone maiden. Ramayana: The Game of Life has all of this and much more - food for contemporary thought drawn from an enduring masterpiece. Shubhs Vilas is a spiritual seeker and a motivational speaker. He holds B.E in Electronics and Telecommunications and law specializing in Intellectual Property Law and Patent Law. To begin with, the cover page is perfect portraying one of the crucial incidents in Book 1 of Valmiki Ramayanam. The title is suitable and compliments the storyline. The book blurb restricts to the contents of the book and also reasons why the book is different. The narrative is lucid and I see that the author has taken ample efforts to deliver an English translation that doesn’t lose essence of Valmiki Ramayanam. Attention is given to minute details and each character is provided with equal importance. Ramayanam is one of those stories which can be reread infinite times and in spite of that you end up feeling that you still don’t know it fully. There are several translations and adaptations of Valmiki Ramayanam. But, this book not only translates, it is also maintains a poetic and picturesque treatment throughout. The author has announced that there shall be six books in this series. I understand why it is six! Because Valmiki Ramayanam is divided into six books! I am glad that somebody has taken the pain to read through Valmiki Ramayanam and presented a commendable translation. I bet that this book will be a treasure! Personally, I enjoyed the book. Having spent most of my life listening to Ramayanam, and Bhagavatham, I am aware of the stories. But, the best part is, I never knew the flow and therefore, I could never inter-connect. Reading this book was more like an exercise of revision. Further, it helped me to know more. The footnotes hinders the easy flow of the books. I wish the author tactfully included it with the storyline rather than complicating with the footnotes. Please don’t have a doubt. I heartily thank the author for contacting me and giving away the book for review. It is a pride and gleeful moment to any blogger!